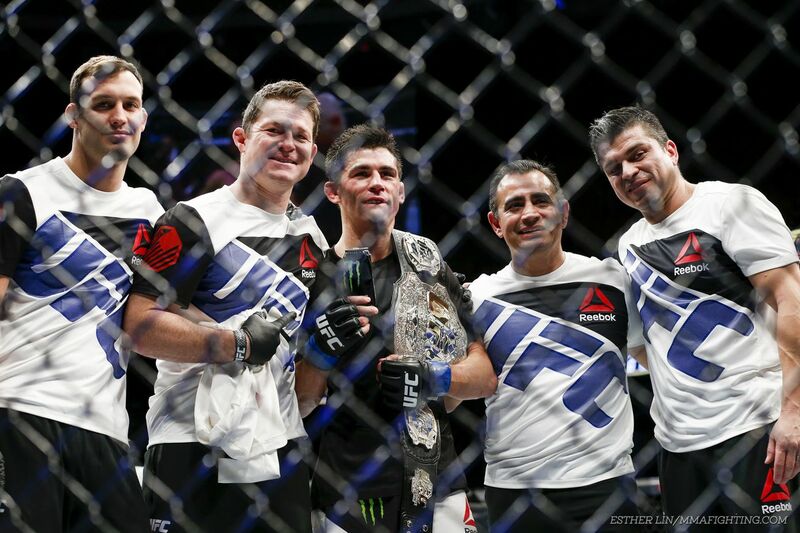 BOSTON – Heading into Sunday night, if you were taking Dominick Cruz’s general proclamation that he might be a better fighter now than he was four years ago with a grain of salt, then headed out of it you were treated to 135 pounds of pure saltiness. Cruz showed up in his most elusive capacity to reclaim his bantamweight title in Boston. T.J. Dillashaw, who knows how to put the tamps on people, hit him only one out of every five times he attempted to. As Brian Stann said, Cruz was a ghost in there. “The Dominator” won a split decision against one of the game’s best, despite being (mostly) gone for four years and recovering from three ACLs, a torn groin, a broken hand, and existential vertigo. It was vintage Cruz, a leaning, bobbing, flickering, deking, feinting, symmetrical bend in hell who uses the cage a canvas, and turns defensive footwork into an abstract offensive art form. It shouldn’t be possible that a man who has undergone so much, who has been so largely forgotten and/or replaced, can show up in such refined form. And he was quick to let everyone know about it afterwards, which was also vintage Cruz. He barely had the belt around his waist when he started letting up his first volleys. He took a potshot at his fellow broadcast analyst Kenny Florian for the borrowed material he got in trouble for this past week. “Kenny Florian, quit copying and pasting, man,” he said before virtually dropping the mic. Why? Well, because Florian picked against him, that’s why. Cruz knows where people are most vulnerable. He doesn’t accept unsolicited doubt. And it wasn’t just Florian’s apparent Ciceronianism that had Cruz fired up. BE Analytics: How has 10-8 scoring evolved over the years?